Electronics developer Sirin Labs is partnering with major Chinese manufacturer Foxconn to deliver a Blockchain-based smartphone called “Finney”. Foxconn subsidiary FIH Mobile will be tasked with mass-producing the latest crypto invention by the Swiss startup. As Sirin Labs CEO Moshe Hogeg explained, the phone’s primary purpose will be to bridge the gap between cryptocurrencies and mass consumers. Hogeg stated that Bitcoin, despite its popularity, still isn’t easily accessible by mainstream technology users, and that the upcoming phone will simplify crypto dealings for its users. Should their patent take off, Hogeg hopes that cryptocurrencies will move out of the realm of the tech-savvy and see widespread use. To help achieve this, the smartphone will come with an array of features geared towards trading and storing digital assets. A notable example of Finney’s crypto-oriented perks is its quick conversion of cash to tokens, which can then be used for purchases on various compatible sites like the popular Overstock.com. The manufacturer also promises many peer-to-peer options that should simplify the exchange of funds among individuals. Besides trading, the phone can be utilized as cold storage for different cryptocurrencies. 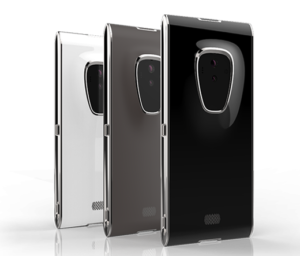 Among other things, Sirin Labs is looking to use biometric authentication like fingerprint and iris-scanning technology as an alternative to traditional methods of ledger storage which involve lengthy security keys. For maximum convenience and security, Finney will also feature a physical on-and-off switch that allows users to hide crypto-related components when they aren’t being used. The Swiss company’s distribution goals are as ambitious as their bottom line. The CEO revealed that their shipping target ranges between 100,000 to a few million units before the end of the year, and that 25,000 pre-orders for the device have already been made. While Finney’s initial price will sit at $999, Sirin Labs will aim to license the technology to other manufacturers in a bid to make the phone available for $200. The smartphone will ship to online retailers and brick-and-mortar stores in October, with countries like Vietnam and Turkey listed among the distributors. Past the initial launch, Hogeg said his company will try to ink deals with mobile carriers to widen the phone’s audience.